While we were in Maine over the summer, we went to a small shop in the town of Lubec and came across a bag of dried blueberries. 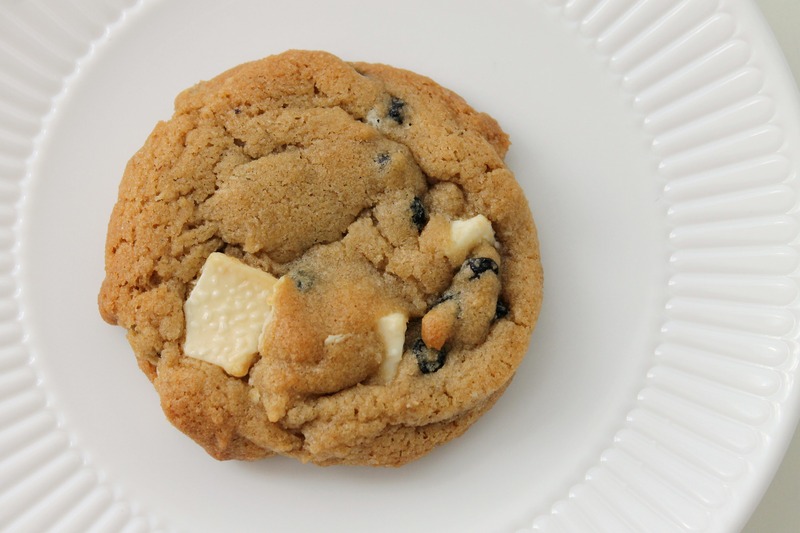 We immediately thought of what we could use them in, and this is what we came up with: a cinnamon-hinted white chocolate chunk cookie with lots of tiny dried blueberries mixed in. The cookie was way better than we could have imagined. It ranks second only to our favorite chocolate chip cookie! Dried blueberries are available in most major grocery stores. Also, it is important to use good quality white chocolate made with real cocoa butter, not the fake Nestle chip kind! Lindt, Ghirardelli , and Godiva brands are all widely available choices. Preheat oven to 325 degrees. Line two baking sheets with parchment paper and position oven rack in the center. Whisk dry ingredients together in a medium bowl; set aside. With electric mixer, or by hand, mix butter and sugars until thoroughly combined. Beat in egg, yolk, and vanilla until combined. Add dry ingredients and beat at low-speed just until combined. Stir in white chocolate chunks and dried blueberries. Drop 2 tablespoons of dough several inches apart on the prepared baking sheets. Bake, reversing position of cookie sheets halfway through baking, until cookies are light golden brown and outer edges start to harden yet centers are still soft and puffy (approximately 11-14 minutes). Do not overbake.